In the long-lost ancient past, two men fought over the girl with eyes like the Bosporus under a summer sky. It ended badly. She died. They died. Since then, they have all tumbled through time, reborn over and over again. Now they are all here, in the same place, the same time and what began so long ago must finally come to an end. 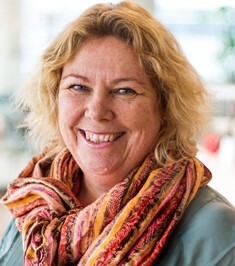 Ask Helle Madsen what she thinks about reincarnation and she’ll laugh in your face. Besides, Helle has other stuff to handle, what with her new, exciting job in London and her drop-dead but seriously sinister boss, Sam Woolf. And then one day Jason Morris walks into her life and despite never having clapped eyes on him before, she recognizes him immediately. Very weird. Even more weird is the fact that Sam and Jason clearly hate each other’s guts. Helle’s life is about to become extremely complicated and far too exciting. Facebook, Twitter, Amazon, and Goodreads. Helle had few memories of her long ago past, or any other lives she had, Jason fills her in on most everything, he does keep from her how serious Sam is to fulfill his destiny. It takes Helle awhile to come to terms with what is happening. What transpires is a dangerous, suspenseful paranormal steamy romance that will keep you turning the pages. 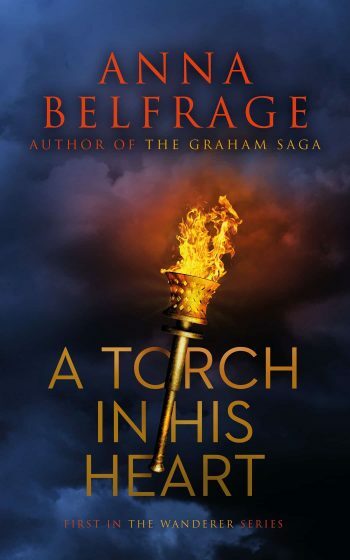 I have read everything, except for a novel or two in her Graham saga and I have to say that she never disappoints. I love a time travel story and this one is unique in that it involves more than one past live. I look forward to the next in the series, The Wanderer which continues the story of Jason and Helle. This review was done voluntarily. 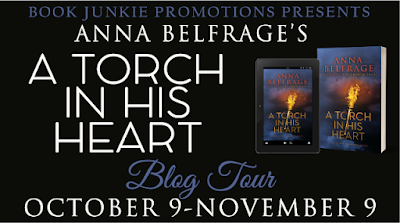 During the Blog Tour, we will be giving away one eBook and one paperback copy of A Torch in His Heart! To enter, please enter via the Gleam form below. Giveaway Rules – Giveaway ends at 11:59pm EST on November 16th. You must be 18 or older to enter. – Giveaway is open to residents INTERNATIONALLY. – Only one entry per household. – All giveaway entrants agree to be honest and not cheat the systems; any suspect of fraud is decided upon by blog/site owner and the sponsor, and entrants may be disqualified at our discretion. Yay, so glad you enjoyed it! I did too! 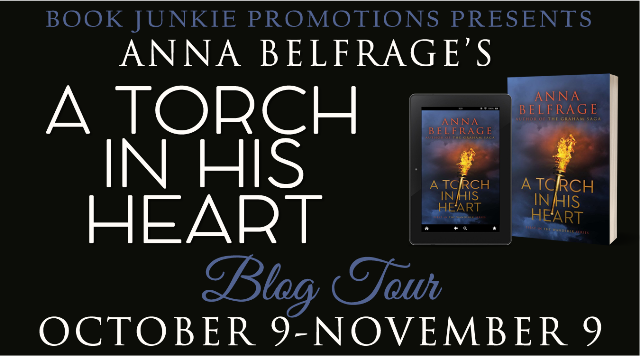 Thank you so much for hosting Anna's blog tour and for your review. You are welcome Amy! I did like it, didn't think otherwise as I love Anna's style of writing and especially the time travel.